Departing from your Hotel anywhere in Tokyo, please be ready for your less than 2-hour ride from the busiest city to the most stunning, peaceful and nature-loving scenery, Mt. Fuji. You will first head to Mt. Fuji 5th Station that offers a commanding view of the Mt. 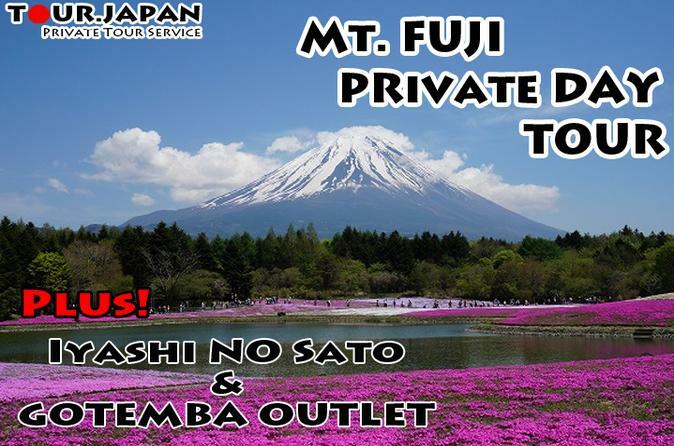 Fuji and Fuji Five Lakes,it's the last stop that can be accessed by public transportation. Next will be the beautiful scenery in Kawaguchi Lake while riding the Kachi Kachi Ropeway. For the lunch, you may enjoy an authentic Japanese food in a famous and the oldest Japanese Restaurant near Fuji Subaru Line. After lunch, you may request to drop by for ashort time in Oishi Park before heading to "Iyashi No Sato" where you can take a photo of the majestic Mt. Fuji. For Iyashi No Sato (Old Village), you may rent a Kimono and unleash your inner Japanese Self, you may enjoy taking pictures while exploring the "Old Village". For the last stop, Shop til you drop in over 200+ stores in Gotemba Outlet, Japan's most popular Outlet Mall. After shopping, you may enjoy the worry-free ride back to your Hotel in Tokyo.